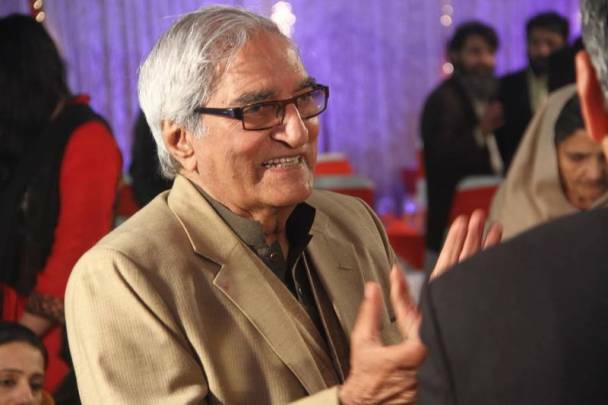 LAHORE: Pakistan’s renowned columnist and poet Munir Ahmed Qureshi, more popularly referred to as Munnu Bhai, passed away on Friday, at the age of 84. Munnu Bhai had been suffering from kidney and cardiac problems for a while and had been going through routine dialysis treatment at a private hospital in Lahore. The beloved poet was born in Wazirabad on February 6, 1933, and was affiliated with journalism for more than 25 years. He also wrote several dramas for Pakistan Television, the most famous being Sohna Chandni which will always be remembered by his fans. In 2007, he was given Pride of Performance award by the state of Pakistan. Apart from his work as a playwright and poet, Munnu Bhai also worked towards free media. He said that terrorism, poverty and social degradation could be eliminated by means of truthful journalism. He strongly believed that with time, journalism in Pakistan would mature and perform a constructive role in society. In 2014, he donated his entire literary collection to Government College University (GCU) as a token of appreciation for its contribution to the promotion of drama and literature. President Mamnoon Hussain has expressed deep grief and sorrow over the sad demise. He prayed for the departed soul and commiserated with the bereaved family. The President said that his services in the field of literature and journalism will always be remembered. The Speaker and Deputy Speaker of National Assembly also expressed deep grief and sorrow over the death of Munnu Bhai. Fans and followers, including Sherry Rehman, Adeel Hashmi, Marvi Sirmed and Juggan Kazim, took to Twitter to express their grief over this loss. I can’t believe Munnu Bhai is gone! Can’t imagine Lahore without his gentle smile and his inimitable ways of speaking truth to power. Two generations of Pakistani journalists at least have been guided by his voice in progressive politics and social justice. May he rest in peace. Renowned columnist, dramatist ‘Munnu Bhai’ passed away today. A huge loss for Pakistan. May he rest in peace. Ameen. Munnu Bhai was laid to rest in Miani Sahib cemetery in the presence of a large number of people from all walks of life.